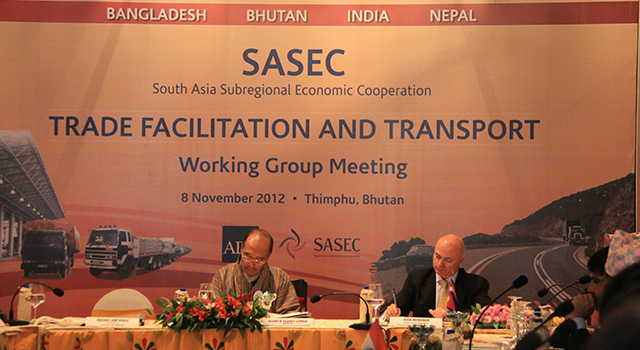 Trade Facilitation and Transport Officials from SASEC countries reviewed priority subregional projects worth over $4 billion at a Meeting held in Thimphu, Bhutan on 8 November 2012. Mr. Juan Miranda, Director General of Asian Development Bank's South Asia Regional Department, and Mr. Dasho Lam Dorji, Finance Secretary of Bhutan, co-chaired the meeting. Bhutan’s Minister of Works and Human Settlement Lyonpo Yeshey Zimba gave the keynote address.